Configuring the Mail application on Macs running OS X or macOS operating systems to include all of your email accounts is relatively simple. In addition to setting up your iCloud email account, take the time to set up your Gmail or any other email providers in the Mail application so you can access them all from within the Mail app. As you set them up, specify the preferred outgoing mail server for each email account. The Mail application attempts to send mail through the Simple Mail Transfer Protocol (SMTP) server it thinks is the default outgoing email server. 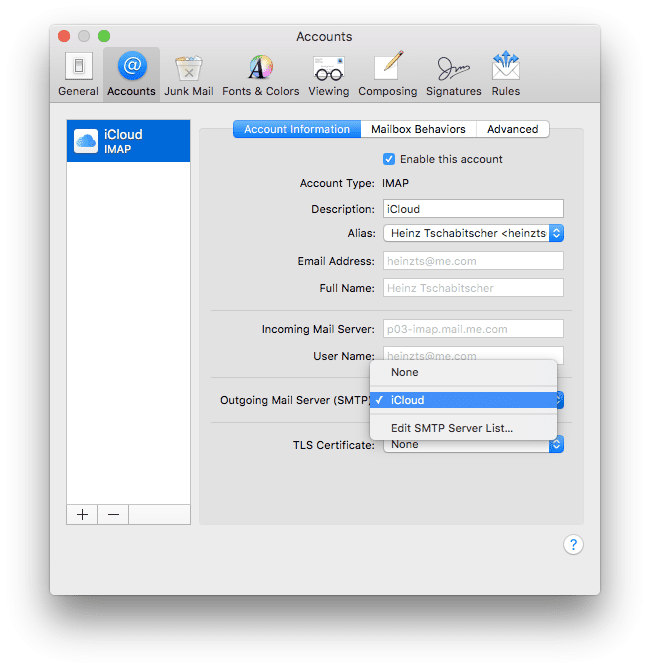 However, you can specify a preferred outgoing mail server for each account you add to the Mail application in Mac OS X and macOS. The app then sends each outgoing email using the SMTP account you specified. Select Mail > Preferences from the menu bar in the Mail application. Highlight the account for which you want to specify an outgoing email server. If it isn't already listed, click the plus sign to add an account. Select the type of account from the screen that opens, enter any requested information, and save the new account. Select it in the account list. Select the Server Settings tab. Choose the preferred server from the drop-down list next to Outgoing Mail Account. If you want to edit or add a new outgoing mail server for an account, click Edit SMTP Server list in the drop-down menu and make the change. Click OK to close the editing screen and then select the preferred server from the drop-down list.